Be sure and check out their site. It contains a wealth of brilliant articles and information. Conservatives have a huge opportunity to improve legislative outcomes during the special session. They’re protected by a Governor itching to go tell the nation about our bold conservative outcomes and a Lieutenant Governor finally convinced he’d better track right in a hurry if he doesn’t want to become the underdog in his next race. The extra attention on Texas is extra attention on these two men, and it plays into conservative hands like it was scripted. By killing the budget on her own, through filibuster, Senator Wendy Davis (D) has gifted Texas conservatives a chance to show their stuff. Republicans need to bring up the major warts in the old budget. For example, the old budget was still a thinly veiled play on between $3 and $4 billion more of the RDF. It funded schools in the first year of next biennium at similar levels as the last one, encouraging schools to spend per normal. Then, the 2013 budget is slashed in half. This is quite convenient. The pain is designed to come when the next session comes together to shore up problems from the 2012-2013 session before moving to the 2014-2015 session. Teachers and administrators will be ready to protest since, if they’re unable to raid the Rainy Day Fund, half of them will be fired. It doesn’t take much convincing to mount a major protest in a situation like that. And remember, moderates are the ones who put the pain squarely on school districts without lifting a finger to find cuts anywhere else. Conservatives, had they been in charge, would have searched hard for cuts elsewhere first. Since they weren’t in charge, they’re proving keeping Texas strong is important enough to teach moderates not to play chicken with teacher jobs next time. Politically-designed funding gimmicks are deceptive and wrong – let moderates and liberals fight for them. Senator Wendy Davis, a lone wolf Democrat who is probably losing her district in redistricting, chose to stick it to the entire legislature by killing the budget with a filibuster and forcing a special session. This swan song gives her name ID and a brand to run on next time the Republican brand is bad, as it was in 2008. “I’m the brave Democrat Senator who killed that draconian budget in 2010, all by myself.” This would be juice for Wendy Davis, though very liberal juice. It could also easily go the other way. The budget could get slimmer. In fact, if it doesn’t, she’ll have earned distinction over other Democrats. To work for a bigger budget is to work for Wendy Davis’s political future. What’s the solution? Add the amount allocated to school districts for both years of the budget, divide by two, and allocate the years evenly. That forces school districts to adjust now, with no legislature in session to protest. Anything less is still effective use of the RDF. Besides, this special session has to be used by conservatives to get a better deal than they were going to get had Wendy Davis not filibustered; conservatives have no other choice. Otherwise, you give the liberals and moderates another tool for minority rule: as long as they control the House Speakership, they can push the budget until the very end of the session and count on a weak Democrat to take the bullet with a filibuster. A conservative budget is hope for Texas and others watching. There is the possibility of even more publicity now. It won’t be Wisconsin during the union fight, but Texas conservatives, including Gov. Perry and Lt. Gov. Dewhurst, could pick up some cache through strength. We need an even better budget to come out of this special session, and one that forces spending changes to happen now. A gimmicky budget that conservatives act gaga about gives others ammo against them. THE PEOPLE WHO RUN THE GOVERNMENT ARE THE PEOPLE WHO SHOW UP. NOW IS THE TIME CONSERVATIVES, SHOW UP!! Texans, I know you are tired from this Texas legislative session because of the deliberate attacks made on conservatives’ bills, redistricting maps, and appointments. However, we have another chance to make our case. Gov. Perry has total control over what he puts into the “call.” He may be ready and willing to insert our conservative agenda bills into the Special Session. In a Special Session, the Senate no longer has to have a two-thirds majority to pass bills. The Special Session could last as long as 30 days; but if that happened, it would cost the taxpayers $1.3 Million. If the Governor exerts the right amount of pressure, he could get the lege moving these bills in and out in a few short days, thus saving taxpayers the $1.3 Million extra dollars. 1. Texas State Board of Education redistricting map — We want SBOE E118 passed because that is the map that the majority of the SBOE members support. 2. Gail Lowe, chair of the Texas State Board of Education, was not confirmed by sine die last night at midnight; therefore, she cannot be the chair for several more years. Such a loss! Now we need to ask Gov. Perry to appoint a strong conservative as the chair of the SBOE — someone who has led in the efforts to adopt all three of the new English / Language Arts / Reading (ELAR), Science, and Social Studies standards (TEKS). This person also needs to be someone on whom we can depend to carry forth the conservative agenda for our 4.7 million school children. These choices of consistent conservatives would be Terri Leo, Barbara Cargill, David Bradley, and Ken Mercer. Charlie Garza is a strong conservative, but he is new to the Board. (A) The restoration to our elected State Board of Education members of the authority to review and remove textbooks (i.e., instructional materials) from the commissioner’s list within 90 days after placement on the list: The well-developed textbook adoption process that involves public hearings, public scrutiny, and SBOE members’ good judgment have served Texas well. SBOE members have made sure the textbooks follow the adopted curriculum standards. Hundreds of factual errors have been found in textbooks because of Texas’ textbook adoption process, and fines by publishers have been levied when the errors have not been corrected. (B) The restoration of the power to our elected State Board of Education members of the authority to remove or approve open source materials and/or electronic textbooks from any list within 90 days of submission: Open source materials can now be submitted by universities and could be written by liberal college professors. We do not want our public school children to use instructional materials produced by liberal college professors without first giving our elected SBOE members the authority to scrutinize those materials and remove or approve them. 4. HB 2923 must be passed because it would ensure that Texas has the authority over what is taught in its public schools and not the Obama administration. HB 2923 says that for Texas schools to be accredited, they must follow the state-adopted standards, curriculum requirements, and tests. Huberty’s bill also states that Texas will not participate in the national database that is going to have student-identifiable, family-intrusive data sent to the federal government. 5. The SBOE has carefully managed the Permanent School Fund to make sure that it grows in wealth in order to pay for students’ textbooks. The SBOE voted to send $3 Billion to the Texas Legislature because by law, the House must appropriate the funds to pay for the new textbooks. The English/Language Arts textbooks are built upon the new-and-improved ELAR standards and will teach children phonics, explicit grammar, correct spelling/handwriting, and other important English skills. The new ELA textbooks only cost $450 Million out of the $3 Billion sent to the lege by the SBOE. The new ELA books are already published and are sitting on the shelves waiting for the Texas Legislature to appropriate the $450 Million (out of the $3 Billion) needed to pay for them. Our Texas public school children would have new ELA textbooks this fall if only Gov. Perry would add this issue to the call and the lege would pass it. I have been told by experienced English teachers who believe in teaching back-to-the-basic skills that the new ELA books are the finest they have ever seen. 6. Anti-sanctuary cities (HB 12) and E-verify (HB 1275) must be added to the call. 7. The further defunding of Planned Parenthood needs to be added to the call. The lege was close to a decision on this issue when a “definition” problem occurred. Surely in this Special Session that definition problem can be corrected and the bill to defund Planned Parenthood can be passed. I must hasten to say that in the mad and stress-filled days leading up to the end of the regular legislative session last night at midnight, some of the above measures may have been passed. However, in a Special Session, provisions can be changed in some bills; and we need to make sure that the seven priorities as stated above are added to the call. If Gov. Perry should add these priorities to the Special Session, then we conservatives need to be ready to go to Austin to lobby heavily for the passage of all of them. 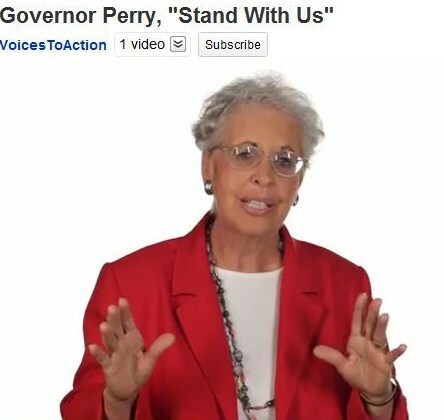 Call Governor Perry's Office Today!! The 81st Legislature ended with a Democrat filibuster of a key budget bill preventing it’s passage. The Texas Constitution requires the Legislature to pass a budget, and a Special Session has been called by the Governor to start today. Lt. Gov. Dewhurst already announced that the 2/3 rule will not be in effect. This would mean that only a simple majority, or 16 votes, would be required to pass a bill in the Senate. This is the opportunity that we need to pass important immigration related bills. However, the very latest word is that only 2 bills, SB 1811 and SB 23 have been added to the special session charge! This is unacceptable in light of the recent killing of a Houston Police Officer by an illegal alien driving drunk. addition of 3 key immigration bills to the special session charge! Now, we need your calls and faxes to Gov. Perry! JOIN IRCOT ON FACEBOOK & spread the word then PLEASE….. Thanks for JOINING FORCES WITH US and being engaged in this battle! Senator Patrick, thank you very much for letting us grassroots citizens know what happened yesterday in the Texas Legislature (posted below). However, I see on your list of requested issues sent to Gov. Perry for the Special Session that you do not have the (1) the confirmation of Gail Lowe as the chair of the SBOE nor (2) the Texas State Board of Education redistricting map. Let me be perfectly honest. While you legislators are down there dealing with so many financial issues, the most important issue that we have in Texas is to keep our public schools moving toward education reform. Those 4.7 million children are the workforce and the strength of Texas in the future. It is those 4.7 million ill-educated children who cost our state a fortune because we spend millions of dollars for at-risk programs, remedial reading programs, juvenile detention, prisons, remedial college programs, drug rehabilitation, single-parent families, welfare, bilingual education, English proficiency classes, unemployment, loss of high-tech jobs because of an untrained workforce, and on and on. The root of all of these is generation-upon-generation of poorly educated Texans. In Texas, the academic achievement of our public school students is based upon one thing: the curriculum requirements (TEKS). This means day-to-day instruction in the classrooms, textbooks, instructional materials, tests, teacher training in higher education institutions, in-service training, teacher evaluations — all are based upon the TEKS. It is the Texas State Board of Education led by the conservatives who have dared to change the direction of our public schools by adopting new TEKS that will teach students to read/write/speak in English, compute, learn scientific concepts, develop proficiency in secondary languages, and become proud Americans because they have studied those historical documents and people of the world upon which our nation is built. To destroy the direction in which our SBOE is leading our public schools at this point would be a terrible disservice to the children whose future lives are dependent upon becoming well-educated citizens. Out of the 15 SBOE members, Gail Lowe is the best equipped to continue as the chair. She has the respect of members on both sides of the aisle because she has been an effective leader as the chair, and she has been a key person who has helped to move the new TEKS documents through the entire process. The Math TEKS are in the pipeline now, and to cause upheaval in the chairship at this important time would hamper the adoption process. Nothing must constrain the timeline of these new core standards as they are slowly but surely being implemented across our state. The SBOE redistricting map is a mess. It deliberately does everything in its power to make it hard-to-impossible for conservatives to be re-elected or elected to the Board. Those who drew it up (E120) have no record of past success with the courts; however, the person who drew up the preferred SBOE redistricting map (E118) is the man who drew up the SBOE map in 2000 which made it through all court challenges. Because of those who controlled the chairships in the Senate and the House, E118 was never allowed to be debated on the floor of either chamber. Surely you and other Legislators do not want the 82nd Legislative Session to go down in history as the one that destroyed the progress of our Texas public schools toward academic excellence. As the session wound down tonight at midnight the Democrats in both chambers killed bills that were vital to conservatives and to being able to pass a budget. In the Senate Democrat Wendy Davis filibustered HB 1811, the school finance bill that had to pass to certify the budget as it contained the formulas to send money to school districts. HB 1811 also contained other key elements including, extension of business tax cut for small businesses under 1 million in revenue that I passed last session and a requirement that a person must prove citizenship in order to get a drivers license. Texas is now only one of three states not to have this in law. If we do not pass it a person may not be able to get on an airplane without a passport because a drivers license will not prove citizenship. Over in the House the Democrats slowed played everything until midnight killing SB 8 and SB 23 was cut nearly 3 billion from medicaid in savings. SB 8 also included the Healthcare Compact language. House Democrats also killed HB 6 which is the school instructional material bill. Unless both chambers can suspend the rules tomorrow, the last day, we will be in special session to take up all of these bills. The disappointing event in the House last night was that the had the chance to suspend the rule to go past midnight to pass all of these bills. They needed two-thirds, 100 votes, to suspend. The vote was 94-53. With only 49 Democrats 4 Republicans obviously voted not to suspend for some reason and several had left the floor or the building. With 101 suspension should have been passed. THERE IS SOME GOOD NEWS: In a special session we do not have to use the 21 vote rule in the Senate. I believe all Republicans will join me and others requesting we do not use the 21 vote rule. Therefore with 101 Rs in the House and no blocker bill in the Senate we should be able to pass everything that the Democrats blocked during session. I am going to send a request to the Governor to put the following on the special session call in addition to the bills listed above that did not pass. 6.And yes the TSA anti groping bill. We have the votes to pass it all. Time to get it done. AUSTIN – The Texas Public Policy Foundation publicly urges Gov. Rick Perry to include the Health Care Compact in his call for the upcoming special session. Legislation containing the Health Care Compact was approved twice by the Texas House and once by the Texas Senate. However, the final legislation containing the compact died due to tactics by a handful of House members. Great new article published today by Weston Hicks with Agenda Wise Reports Be sure and check out their site. It contains a wealth of brilliant articles and information.